At the end of last year, I saw a post from my friend Jan Norris about her “Gratitude Jar.” When I read the post I was moved by the unique simplicity of concentrating on the good and making those special memories the focus of my day. While we all deal with crap on a daily basis, we often overlook the blessings. 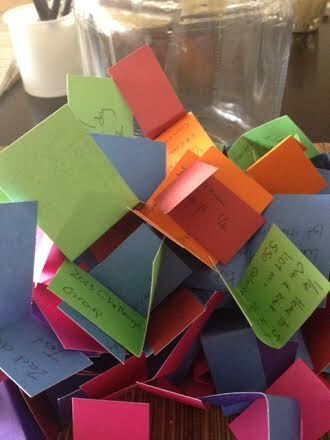 After reading the post, I started my own Gratitude Jar tradition. All year the nondescript jar has sat in the middle of my table. As the seasons changed, colorful slips of paper have created a tapestry of wonderful memories contained within the glass. Today, to begin a new year, in anticipation, I sat and opened each slip of paper. I read the papers, I reflected and my heart filled with joy. 2013, while it had its junk, was a pretty awesome year filled with simple blessings and memories that I will hold tight forever. I placed that mound of memories in an envelope and sealed it, placing it in my treasure box. Someday I may relive those memories again, or the envelope may never be reopened; but the wonder of 2013 will be contained there forever. Today, with my jar empty, I began to refill with 2014 gratitude. It’s going to be a wonderful year, there will be challenges, disappointments and crap…. but I know if I let it happen there will be more Gratitude than anything else. What a great way to begin the year? I heard the concept of the Gratitude jar as well, last year but never really began one for myself. I guess, I must do that…this year! Lovely post! do it, you wil be glad you did!